Party with us at The Wish Festival! Have a party with us and popstar Beatie Wolfe this Sunday! Half Term is here! And we’ve got the perfect way to kick it off – hanging out with us at The Wish Festival this Sunday! Taking place at Whole Foods Market Kensington this Sunday from 10am to midday, The Wish Festival is going to be packed with great stuff well worth getting out of bed for! 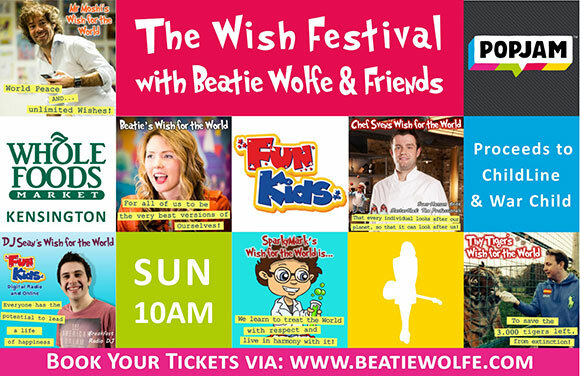 Beatie Wolfe is going to be there doing an exclusive performance of her track “Kids Wish for the World”, plus there will be brunch menus, interactive arts, games & tech activities and its own wishing well. Oh, and we’ll also be there too! Sean from Breakfast will be on the decks creating the perfect party atmosphere and maybe even giving you the chance to go out on air! And all the money will go to Children’s Charities, NSPCC and War Child, so a great way to raise money for charity too.